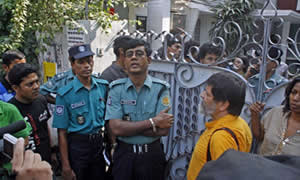 Drik Gallery officials told The Daily Star that the gallery was closed around 3:30pm, which was set to start the exhibition of photos by Shahidul Alam styled 'Crossfire' at 4:00pm. The organisers said a police team led by Dhanmondi police chief Shah Alam entered the premises of Drik Gallery without permission and asked the authorities to cancel the exhibition immediately. But the Drik authorities refused to shut the gallery as the photos on display were symbolic and allegorical. Police could not show any warrant, court order or any executive order, they said. As police barricaded the entrance of the gallery, the organisers opened a street exhibition outside Drik Gallery. Noted Indian writer and human rights activist Mahasweta Devi inaugurated the event along with Nurul Kabir, editor of the New Age, M Hamid, chief executive officer of RTV and Jorge Vilacorta, a curator from Peru. Our friend circle is interested to work against Extra judicial killings. Thinking about T-shirts product. Drik's photos are needed. its a normal situation for our system, isnt it? when a citizen of a country starts to accept situation like this is "Normal", that's makes us worried! - we would like to say "that is abnormal to accept it as normal"
Pls talk to the authority of Drik! They might permit you to do that!